Takeaway: Neil Ackerman of Mondelez, the international snack giant, shares five simple key levers for driving growth. Adopt these tips at your company to consistently provide consumers with the best selection, prices, content, and brand experience. 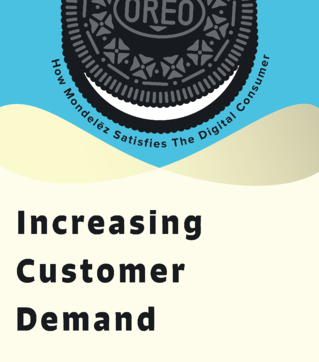 Last week, Neil Ackerman, Mondelez Director of Global Ecommerce, joined Salsify’s VP of Customer Success Lee Feigenbaum in our recent webinar, titled Increasing Customer Demand: How Snack Giant Mondelez Satisfies the Digital Shopper, and shared how putting customers’ needs first can drive your brand performance to outperform your competition. You can get the event recording, or read some of our favorite takeaways below. Ackerman, a former General Manager at Amazon, starts by painting a picture of a flywheel, a rotating mechanical device where the energy of one element transfers onto the next, causing the wheel to spin through rotational energy. As each element performs at its top rate, the wheel spins faster and faster. 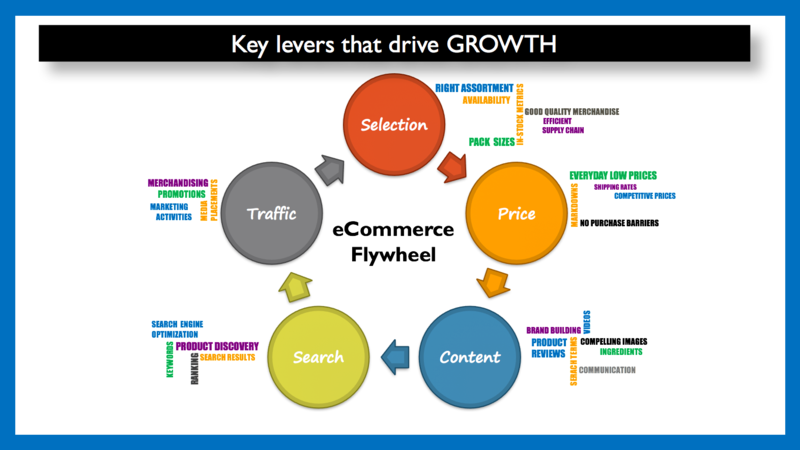 The Ecommerce Flywheel, according to Ackerman, consists of: Selection, price, content, search, and traffic. 1. Seize Selection Opportunities. Keep the selection process simple and ensure a focused assortment of quality, desired products is in stock and available online or in-store. Be sure to create impulse and bundling moments with content and strategic pairings of products. 2. Set the Right Price. Establish prices as everyday low ones, don’t confuse consumers with up then down sales, and remove purchase barriers like shipping fees or minimum spend requirements. Look for ways to streamline hiccups in your supply chain to make it more efficient and allow for more competitive pricing through reduced costs. 3. Develop Content to Maximize Conversion. Create relevant, accurate, and up-to-date content for the season on all channels to ensure the information is complete and the consumer knows what they are purchasing. Avoid errors at all costs and edit product content to be robust and comprehensive. Go beyond the basics of the product title, image and video, description, and key features, and include lifestyle images, brand stories, seasonal banners, relevant upsell opportunities, and comparison charts. Remember, Ackerman advises, “It’s a one-screen world.” Easy-to-find, fun content improves conversion. 4. Optimized Search Leads to Higher Traffic. Buy keywords based on consumers’ intent, invest in SEO, and take care to include all different spellings, misspellings, and product name variations. If you can win the game of capturing consumers who misspell chocolate as chalkolate, chaukolate, choklate, or chaklate, then you’re reaching a larger audience that might not otherwise find your product. 5. Listen to Your Consumers! Increase traffic through building trust, offering convenience, and measuring change. The buying experience does not end with the transaction. Positive ratings and reviews, customer service and relationship management are crucial to the experience. An exercise all brands should perform, according to Ackerman, is to call your customer service group and experience the customer relationship management for yourself every 30-60 days. It’s also wise to then also call your retailer’s customer service and do the same. Lee Feigenbaum, Salsify VP of Customer Success, shared how he’s seen other brands implement the kind of large scale improvements to the product content to drive digital sales momentum. “A market shift of this significance demands a response that goes beyond a single person, beyond a single team. It needs an organizational response,” Lee says. He shared his view on how customer-centricity and the primacy of digital demands organizations think of how they can be digital-first. Specifically when it comes to building the right relationships around how product content is created, managed, and shared inside your company’s four walls and into the wider ecommerce ecosystem. To function effectively, your content team must orchestrate the interactions of many other parts of the organization including your brand team, your ecommerce team, your regional product team, and your legal and corporate compliance team. The more centralized and intuitive you can house that product content, the easier it is for all your teams to change and adapt as to meet the needs of your customer and keep the flywheel spinning.